Your guide to Paul McCartney's perfectly normal legacy in the 1970's. I’ve read a lot of rock criticism in my life. It’s true I don’t reach for my Lester Bangs volumes as much as I did in college. And, sure, I’ve become a less avid reader of Pitchfork as I spend more of my time glaring at the approaching age of 30—half out of dread and half out of boredom. But regardless of my current headspace, I consider myself well read on various critiques of rock n’ roll music. Any music nerd out there should thrill at this sentence! First, there is the critical observation stating that the album is, in a way, terrible; then, there is the quick and efficient explanation into what makes it fascinating—feigned ordinariness!—before the final admission that the album has a singularity that would allow some poor, misguided soul to find deep merit in it. What true music fan doesn’t have a record—or records—he wears as a badge of pride in this way? I know I have several, and Wild Life happens to be one of them. I am a fan of Paul McCartney’s solo work. Though, to be fair, my extensive knowledge is limited to everything from 1970-1980. There are certainly solid and truly enjoyable Paul McCartney records after that point (his 2013 album, NEW, being one of them), but I find the work he did between the Beatles’ breakup and John Lennon’s death to be truly fascinating. Sure, there is perhaps no greater solo Beatles record than All Things Must Pass; no truer artistic statement than Plastic Ono Band; and no more deep cut, wink-wink album than Ringo’s Beaucups of Blues. But no Beatle can truly match the range, confusing decisions and overall performance art of Paul’s solo output from the 1970’s. What do I mean by performance art? I mean exactly what Mr. Erlewine wrote in his review of Wild Life: that is, the feigned ordinariness of McCartney’s output in the 1970’s. We live in a world where there is a fashion trend called “normcore,” which is basically a conscious choice to dress like a “normal person.” “Normcore” is an absurd notion, but it is one of those instances where fashion becomes a kind of performance art in its own right. What the “normcore” fashion decision says about a person, I don’t know. Is it a way to show intelligence or hipness? Perhaps. Is it a way to take a jab at what society deems to be “normal” attire? Sure. Is it a way to hide your fear of losing some kind of perceived edge, by consciously choosing to dress in “normal” manner? Maybe. In a way, post-Beatles McCartney was perhaps the forefather of “normcore”. Just look at the famous photo on the back cover of his first solo album, McCartney. Paul stands in front of a Scotland field permeated with twilight. His face is adorned with a scruffy, “dad on vacation” beard; he’s wearing what appears to be a standard white t-shirt that is obscured by a large, comfortable-looking winter coat lined with fur. 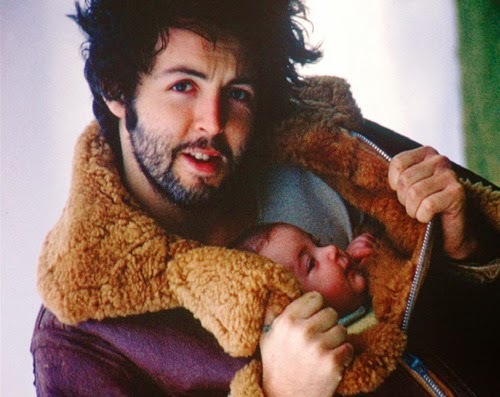 Tucked in amongst that fur lining, the head of newborn Mary McCartney pokes out; she smiles the disoriented smile of an infant in front of a camera. And the photo credit goes to none other than Linda McCartney. Now, it may seem like I am reading a bit much into a simple, pleasant, photo on the back of a musician’s first solo album, but you have to remember that this is a Beatle we are talking about. At the time, Paul McCartney was a living deity. When McCartney was released, Paul was arguably one of the ten most famous people in the world, and when you take this photo, along with the blatantly “charming” and “laid back” quality of the music on the album, the entire statement is one of a volitional decision to retreat from super-celebrity into “standard,” domestic life. That brings us back once more to that wonderful phrase “feigned ordinariness.” Elsewhere in Erlewine’s review of Wild Life he describes the music as “something that sounds easy—easy enough that you and a couple of neighbors you don’t know very well could knock out in your garage on a lazy Saturday afternoon—and that’s what’s frustrating and amazing about it.” Again, this is unimpeachable rock writing! Erlewine perfectly conveys the befuddlement that many listeners in the 1970’s must have felt about each successive McCartney release, but at the same time recognizes what an incredible phenomenon it is that a visionary, cutting-edge (remember, Paul was the one who brought Stockhausen and tape loops to the Beatles’ table along with “Martha My Dear”) musician and song-writer like McCartney would willfully make this type of artistic decision. We’ll get to Wild Life as a case study in a moment, but for now, for those of you less familiar with all of Paul’s records in the ‘70’s, allow me to present a quick, album-by-album rundown to chart his decisions. McCartney (1970) – Along with Dylan’s John Wesley Harding (1967) this is the archetypal “back-to-basics” rock record. By that I mean it set the precedent for a rock artist to pull back from the excesses of previous work and “find him or herself” most likely in some kind of home studio. This album features simple love songs to Linda (“The Lovely Linda”), half-baked, enjoyable grooves (“That Would Be Something”), simple pop gems (“Every Night”), an instrumental rocker (“Momma Miss America”), a pair of Beatles rejections (“Teddy Boy” and “Junk”) and perhaps his all-time best ballad (“Maybe I’m Amazed”). Ram(1971) – This is the critical darling. Part home-recording, part big-studio wizardry, this is the best album Paul made post-Beatles. There is the trademark medley (“Uncle Albert/Admiral Halsey”), a Beatles diss track (“Three Legs”) influential alternative-pop (“Smile On”), unhinged, only-Paul-could-do-this screaming (“Monkberry Moon Delight”), by-the-book McCartney craftsmanship (“Dear Boy”) and an epic rocker (“Back Seat of My Car”). Wild Life (1971) – The first official Wings album. Feigned ordinariness. We’ll get back to this. Red Rose Speedway (1973) – An overlooked classic. This is a full-blown McCartney (fine, Wings) studio effort. There’s a pair of rollicking rockers (“Big Barn Bed” and “Get On The Right Thing”) an AM ballad (“My Love”), a weird instrumental (“Loup (1st Indian On The Moon)”), Paul showing off his vocal range (“When The Night”), and an Abbey Road­-esque, album-closing medley. Band on the Run (1973) – The blockbuster. This record is filled with hits—the title track, “Jet”, “Mrs. Vandebilt”, “Helen Wheels”—and great deep cuts—“Picasso’s Last Words (Drink to Me)”, “Nineteen Hundred and Eighty Five”. It also features one of my favorite Paul songs: the Lennon satire “Let Me Roll It”. Wings at the Speed of Sound (1976) – Once again, Paul is in full-on “band mode.” Everybody gets a turn singing and it’s not pretty. I’m a sucker for “Let ‘Em In”, but really no one should ever listen to this album. If you can make it through “Cook of the House”, you truly like pain (of the sweet kind!) as much as I do. This record is like a loaf of Wonder Bread with the crusts cut off. Wings Over America (1976) – The live document of Wings’ stadium cramming 1976 tour. Watch the movie Rockshow to give you an idea of what was going on this album and tour. Paul finds the camera in every shot and manages to fit approximately 100 different inflections of “oh, baby” into his stage banter. Here, Paul is expertly playing the role of a guy just “havin’ a good time with his band.” Maybe he was, but it’s hard to not view and hear it as Performance. London Town (1978) – Perhaps the most underappreciated McCartney album. This is still under the Wings name, but it is really Paul, Linda and the stalwart Denny Laine. The title track, with its shimmering keyboard and flourishes of “Rule Brittania” trumpets, is oddly affecting. “Backwards Traveller” has the best opening five seconds in Paul’s entire catalogue. “With A Little Luck” is a perfect pop song. “Girlfriend” is the best track Michael Jackson never sang. “I’m Carrying” is a classic, overly-sweet but not saccharine McCartney ballad. Back to the Egg (1979) – This album feels like the 70’s are wheezing to the finish line and that Paul is out of ideas. “Getting Closer” is an inoffensive rocker, “We’re Open Tonight” is short and weird enough to be interesting, and “Rockestra Theme” is a guilty pleasure. Other than that, though, there’s really not much here. McCartney II (1980) – This is the last album McCartney made before John Lennon died. Paul recorded this album in his home studio and it sounds as if he had heard about Prince but never really listened to his records. “Coming Up” will make you giddy. “Waterfalls” is a fantastic synthy ballad. “Temporary Secretary” is the first song to sound like a box of rubber bands repeatedly falling off a metal shelf. “Bogey Music” is a dumb rocker in the best way. “Frozen Jap” and “Front Parlour” are somewhat dated, but still great instrumentals. And “Darkroom” sees Paul come up with one of his best sexual innuendos. Opinions are mixed on this album, but I love it. Paul sounds recharged and inspired for a new decade. To me, when taken as a whole, McCartney’s output from 1970-1980 seems like an ongoing therapeutic experience in reaction to the staggering fame and trauma he experienced as being part of and breaking up with the Beatles. When the Beatles dissolved, McCartney was approaching 30, he had his whole life ahead of him and he’d already experienced the highest level of notoriety that any one person could experience. It would seem natural then, that he would stick to the things that seemed normal and real—his farm in Scotland, his wife, his children, his ramshackle band. However, in doing that, in moving so strongly towards those things, he ended up constructing a kind of artifice that was different from the Beatles. He was a larger than life figure who just wanted to be a regular guy: whether making music with his family or as just another guy in a band called Wings. But he wasn’t “just another guy,” he was Paul McCartney. With all this said, I still have to return to Wild Life and the idea of feigned ordinariness. There is nothing remarkable about Wild Life. The album opens with a grating rocker called “Mumbo.” Paul screams and “woos” all over the track, there’s a wonky guitar and messy drums, but nothing that really sticks with you. The second song is called “Bip Bap.” The lyrics consist of Paul scatting, in a strange raspy voice, the words “bip bap” along with a bunch of other barely distinguishable lyrics while a vaguely country guitar and simple drum rhythm plod along. “Love is Strange” is a reggae-influenced cover of the Mickey & Sylvia song from 1956 that alternates between annoying and pleasing upon repeated listens. The title track is a slow, hypnotic song about picnics and animals in the zoo that should be terrible, but somehow ends up being fascinating. “Some People Never Know” is tossed off pop that Paul seems to come up with while he’s eating breakfast. “I Am Your Singer” feels as though you are walking in on Paul and Linda lying in bed after a long day giving interviews to the press. “Tomorrow” is an underrated classic; only Paul can write and sing a song like “Tomorrow.” And, finally, “Dear Friend” is a haunting, out-of-place album closer that at some moments feels painful, but at others makes you think it might be the best, most artistic song that Paul has ever written. As you can see, it’s clearly a mixed bag. However, what sticks with you is how ordinary it all sounds and feels. In another classic line from his review, Erlewine describes Wild Life as the sound of McCartney “trying to make a record that sounds as pastoral and relaxed as the album’s cover photo.” And he’s right! The entire record seems to flow from Paul and Linda’s following construction: have their newly formed band sit on a branch above a peaceful English stream, snap a cute “band photo” and then make the record that would most likely accompany the picture. In some perverted way, Wild Life represents the same line of thinking that brought Paul to come up with the idea of Sgt. Pepper’s Lonely Hearts Club Band. This time, though, instead of inventing a psychedelic band that stood out of history and time, his vision was a band sitting perched on a tree branch just feet above a dappling stream on an autumnal, slightly overcast Saturday. And there is a charm, a merit in that feigned ordinariness. It may not be inherent in the music Paul made on Wild Life or his other albums from his first post-Beatles decade, but it’s certainly there in his approach. Perhaps both myself and Mr. Erlewine are reading a little too much into a mediocre album from 1971. I’ll never be Paul McCartney or experience his level of fame, but I know what its like to sit looking at the age of 30, feeling as though your life is both fully ahead of you and somehow completely behind you; and wondering what to do next. Wondering which desires are real and which ones aren’t. Sometimes while you’re figuring out where life went and where it’s going, you have to decide if maybe its time to let certain ambitions go. And while you’re doing that, maybe you just want to feel comfortable; you want to pretend for a minute that life really can be simple. And that’s all right, even if in the end it is a conscious, artistic decision and perhaps just another way of fighting off self-doubt. I don't get why you're willing to praise All Things Must Pass and Plastic Ono Band, both great albums, and yet you refuse to put Ram in the same category. Ram is a brilliant album, widely acknowledged (not) as such. You may say it has flaws. Well so does All Things Must Pass (dated productions, flat vocals, a plagiarized song, preachy lyrics) and so does Plastic Ono Band (there's no getting around the self-absorption; this is a milliionaire moaning about his mommy issues). Those flaws don't prevent them from being great. And neither do Ram's flaws. What grates is this continuing tendency of critics to be dismissive of Paul's solo work. He was trying to do something entirely different from the Beatles. And he succeeded at times (Ram, Wild Life, McCartney II) and he fell short at other times (Speed of Sound and much of his 80s work). But for me, George's solo work has increasingly diminishing returns: dull dirges and too much religious hectoring. And John's solo work is a vast disappointment after Imagine. McCartney is the only one with any record of consistency in the 70s. P.S. McCartney II is fantastic. John Lennon's 1974 Walls and Bridges album is a very good album,and it has the brilliant,beautiful Number 9 Dream on it and John not only wrote this whole album but produced and arranged it by himself including this song.And John's singing on Number 9 Dream is typically really beautiful and great.And John's songs on Double Fantasy are all very good. And I don't like McCartney 2,the only thing great on it is Paul playing all of the instruments by himself like he did on his first good solo album,McCartney 10 years before. Sorry for any confusion. I love Ram. It's one of my favorite albums of all-time. I like it better than All Things Must Pass and go back and forth as to whether or not I like it better than Plastic Ono Band on a daily basis. I was more speaking to the general consensus of solo-Beatles albums. The one I face when I try to argue for Paul's "lesser" solo works and am only greeted with disapproving shakes of the head. You're preaching to the choir about solo McCartney. Very enjoyable summary of that decade of Maccas output, lots to agree with there. In terms of other significant material from the 70's - I always like to include Percy 'Thrills' Thrillington's interpretation of RAM which is surely up there as one of his oddest and now grooviest projects ? Being a long time McCartney 'apologist' I'm totally enjoying the revisionism that appears to be going on these days especially with his more eccentric / much derided at the time albums like Wild Life and Mccartney II which seem to have stubbornly waited for their chance to be understood. I know a lot of kids / musicians that are getting into Wild Life lately. Following that trend, I'd suggest wandering a little into the 80's towards his 1986 flop 'Press To Play' it's got some really odd gems on it and though, strictly speaking reflects the sound of the decade, in hindsight along with the dadcore, classic balladry and rockers also has those trademark eccentric moments that get as experimental as McCartney tends to get. I'm also spending more time with Back To The Egg these days, Arrow Through Me, Reception, Old Siam Sir, are pretty damn good. Great article, thanks for sharing. Paul's 1975 Venus & Mars Wings album is a great rock album and out of the majority of great reviews on amazon.com it gets a well deserved 5 stars out of over 100 reviews for this album. This is one of the *GREATEST* solo/Wings Paul albums he ever did! It's great and it's Beatles quality because every song is very good & if anyone wants to know what a true music genius Paul really is,just listen to the *music* in the great Letting Go. My mother only liked classical music,Beethoven,Bach & Mozart,no rock & she played their music on the piano.When I was playing this album and she came into the room when Letting Go was on,she asked me is that Paul McCartney and I said yes and she said Oh that music is brilliant,he's a music genius like Beethoven! My mother was also a talented artist who sculpted,and drew with charcoal pencils and pastels, and she even sold some of her sculptures at a few local galleries. And my sister who is 4 years older than me and had a big diverse music collection since she was a mid teen,bought Venus and Mars when it came out,and I remember listening to it with her,and her friend and my best friend and we all loved it. My sister still says years later that Venus and Mars is one of the best rock albums she ever heard and that it's unique and she knows no album like it. She always said his 1971 Ram album was a very good album too,although I like this album much better and I really don't understand all of the love everywhere for his Ram album I think it only has 3 great songs on it, the great rocker Too Many People,Uncle Albert and Back Seat of My Car. Paul's best post Beatles sounding music was from 1970-1975,with this being his last true great album.After this he wrote some good music but he never wrote the same great quality music again for some reason. His first solo album McCartney where he played every instrument by himself (and he played them all great) is very good,Red Rose Speedway and Band On The Run are very good albums too,and he produced all of these great albums by himself and co-arranged the music on Venus and Mars by himself.